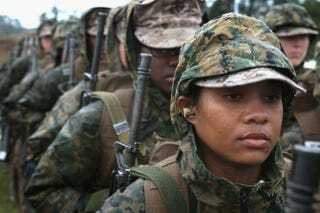 Marine recruit Christina Wauchope waits with other female recruits to fire on the rifle range during boot camp at MCRD Parris Island, S.C., on Feb. 25, 2013. Women may have to register for the draft as soon as 2018, based on the passage of the National Defense Authorization Act on Tuesday in the Senate. The bill included the amendment that would require women who turn 18 on or after Jan. 1, 2018, to register for the selective service, the New York Times notes. If women do not register for the draft, under the bill they could end up losing various forms of federal aid, including Pell Grants, which is the penalty that men currently face. “The fact is, every single leader in this country, both men and women, members of the military leadership, believe that it’s fair, since we opened up all aspects of the military to women, that they would also be registering for selective services," Sen. John McCain (R-Ariz.), chairman of the Armed Services Committee, said. As the Times notes, in 1981 the Supreme Court ruled that women should not be required to register for the draft because they did not participate in the front lines of combat. However, since all combat jobs have recently been open to women, military officials are now arguing that women should be required to sign up for the draft. Some, however, clearly did not agree. "The idea that we should forcibly conscript young girls in combat to my mind makes little sense at all,” Sen. Ted Cruz (R-Texas), who is also the father of two little girls, said on the Senate floor last week. The ball is now currently in the court of the House of Representatives, where the move does have support, although the amendment was not included in the House version of the bill, the Times reports. The House had originally included the provision, with Rep. Duncan Hunter (R-Calif.) introducing it in order to make a point about women serving in combat roles, even though he strongly opposes the idea. Hunter then voted against his own amendment, which ended up passing anyway with bipartisan support and then, in a procedural move, was removed from the final bill before it went to the floor, the Times notes.